Pathways are flexible, innovative ways to experience Girl Scouting for girls. By choosing how they participate, girls and volunteers are able to engage in ongoing cycles of action and reflection while gaining and promoting the fun and friendship inherent in Girl Scouting nationwide. Through Pathways girls gain specific knowledge, skills, and values that empower them to lead with courage, confidence, and character. Girls and adult volunteers can choose one, some, or all of the pathways within a single school year. 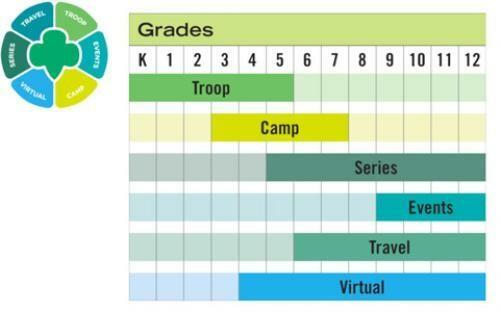 Troops are the most traditional way that girls can experience Girl Scouting. The Troop Pathway offers the same group of girls the opportunity to participate in a variety of activities, usually over the span of nine to twelve months. Girls may join a troop in their geographical location at any time during the year. Girls in troops do activities together as planned by them and their troop leader. Troops can participate in all of the pathways as troop activities. Events are one-time, stand-alone program offerings. The primary difference between the Event Pathway and other pathways is that different girls participate in each event, as opposed to one group of girls coming together regularly. The events can be a few hours long, all day, or, occasionally, overnight. Events allow girls to have the Girl Scout Leadership Experience when and wherever they like. Series offerings are a sequence of linked program sessions - offered by the Council or community partners - that relate to a specific theme or purpose and feature cumulative, sequential experiential learning. The length of each series is different, they typically run over multiple weeks, and is specified at the outset. By choosing to participate in particular series, each girl commits to completing the entire series as a complete program package. The series pathway is a great way for girls to discover and develop new talents and interests in a fun, interactive setting. The Camp Pathway features day, weekend and resident experiences that introduce and explore the out-of-doors. A defining characteristic of this Pathway is that it is an outdoor, condensed experience. The emphasis is on safe, out-of-doors activities and includes a focus on environmental or outdoor education. Girls can participate in day and resident camp experiences; there are also ways to camp as a troop or family. Every girl deserves a chance to see the world. Girl Scouts offers many different travel opportunities so girls can see new places, meet new people, and learn about different cultures and ideas. The Travel Pathway offers girls leadership opportunities and cross-cultural understanding through local, regional, national, and international travel. Girls prepare, plan, money-earn and participate through group travel, Council-sponsored trips or nationally sponsored excursions. Whether exploring their own neighborhoods, going on overnight camping trips, participating in community service projects, or flying to one of the four world centers, Girl Scouts are continually expanding their horizons. 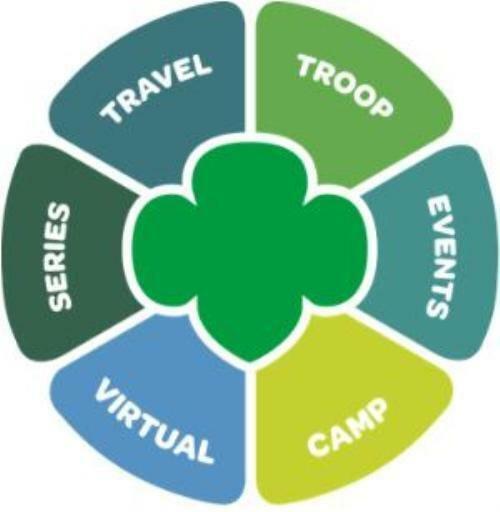 Virtual Girl Scouting allows girls to join an online Girl Scout community that provides them the opportunity to participate in Girl Scouting regardless of their geographic location. It’s a great opportunity for older Girl Scouts to stay connected with their sister Girl Scouts while managing their busy schedule of school, work and extra-curricular activities.